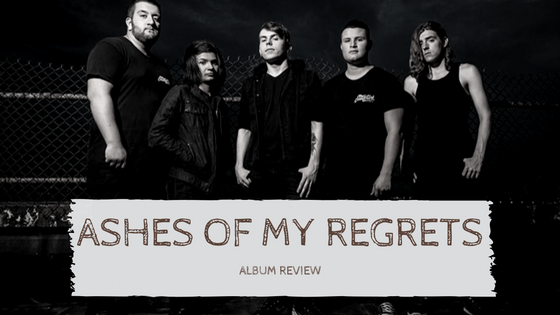 After actively working on creating an EP that demonstrates an evolved sound, Ashes of My Regrets took it to the next step of their career. With a shared passion for metalcore, this group of longtime friends-turned-musicians turned to each other after finding their individual projects dissatisfying. Not only did they share a passion for the genre, they shared a passion for the commitment it took to establishing themselves as artists. The easiest takeaway this time was working with a producer and getting that second opinion that they really thought they could have used during We All Have Our Demons. For their latest EP, Caricatures, their modern spin on metalcore combined with their want to share joyful songs with their audience has gotten them strong feedback. The definition of caricature is, “a picture, description, etc., ludicrously exaggerating the peculiarities or defects of persons or things.” After doing their own research on the concept of the word, the band decided they wanted to create their own spin of the word; similar to them creating their own spin on their genre. Instead of exaggerating a picture, they wanted to exaggerate emotions and situations that the songs are about. “We wanted to treat the songs as different feelings and emotions – hope, sorrow, anger, depression, anxiety…” Rodriguez said. The EP has six tracks including a self-titled introduction song. At just 1:19, the band wanted their first song to be short, sweet and to the point about what they wanted their audience to gain from listening. Stand-out track of the EP is “Daydreams” which is a personal song for Brandon. Inspired by a close friend of his who battled with depression, this is the kind of sound that gives them the edge on what they’re trying to accomplish. Ashes of My Regrets have the foundation of passion that has brought them to this EP release and has set the path for them to continue pushing past their comfort zone and into an even better next album.